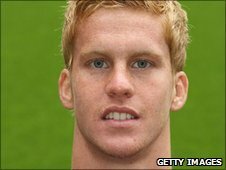 Oldham Athletic have signed Manchester United goalkeeper Ben Amos on loan until the end of the season. The 20-year-old has played three times for United, including a starting appearance in their 1-1 Champions League draw with Valencia in December. He had a loan spell at Peterborough United last season, but made just one Championship appearance. The England Under-20 international was allowed to leave Old Trafford following the signing of Anders Lindegaard.